Back from Leeds, Manchester and off to London & The Cotswolds! In Full Swing at Thorner Victory Hall! 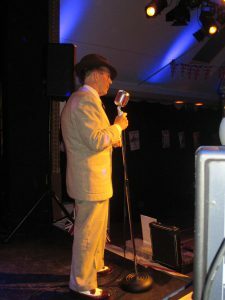 Hello every-one once again I’m writing on the run between shows as I get ready to head off to my hotel as Paul and I are performing at Mill Hill Synagogue a Big Band and Swing show tomorrow before heading off to Covent Garden in the evening. We’ve had a full weekend and I’m typing with care trying not to knock my nail varnish as I desperately need it to dry before hitting the road. Paul Doing His Swing Thing! 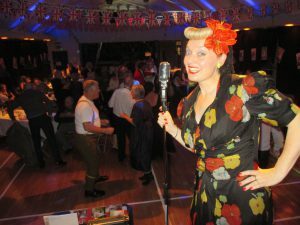 a WW1 cabaret featuring all the popular Music Hall songs from the time followed by a Big Band and Swing set with songs from the 1940s. Paul had been engaged to preform too as we got everybody up on the dance floor dancing to the very best swing tunes of the time. 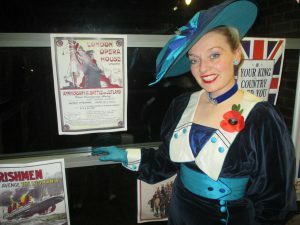 A great deal of effort had gone into organizing the event and the hall had been beautifully decorated with flags and posters from the Great War which even included a WW1 exhibition. Dinner was served just prior to our show which featured shepherds pie and apple pie and cream which went down really well with the guests. Nearly every-one had dressed up for the occasion which was delightful to see and we finished the evenings entertainment with The White Cliffs of Dover/We’ll Meet Again and British themes. 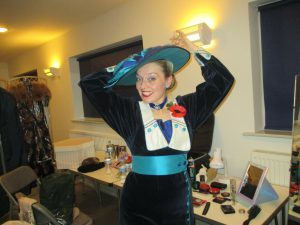 Getting Ready Back-Stage for My WW1 Set! audience gave us a standing ovation through a sea of waving union jack flags. So thank-you to David for engaging us as it was lovely to be part of your event. That night we stayed just down the road at Crocodile House and we were made extremely welcome by our hosts Carol and William Heaton who also came and saw our show on Saturday night. 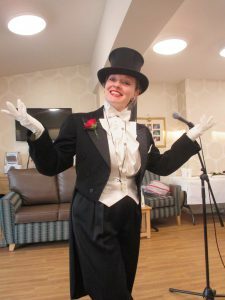 The next day Paul and I were on the road by 11.00 am as I had been booked to perform a Music Hall show in Manchester for the Bramhall Community in Sale Moor. I revived a call out off the blue back in March thanks to the Bramhall organizer Peter. Before the Show at Victory Hall! As I was already working in the North I was able to click the two jobs together and call in on my way home. Once again we were given a wonderful welcome and both Paul and I hope very much to return in the future as I finished my second set in my top hat and tails with the aria Nessun Dorma, but then you can’t go wrong with Puccini! Again” ATS show for a special event arranged by Mc Carthy and Stone so it’s a very busy time! 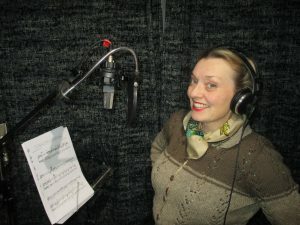 Laying Down My Christmas Vocals! Gosh is that the time! Must dash! Keep Following and Toodle Pip!